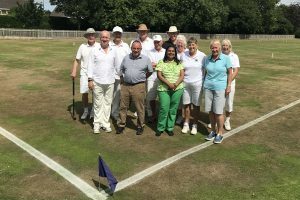 One of the Croquet Association’s national competitions for level play golf croquet was hosted by Chester Croquet Club over the weekend of 4th and 5th August. 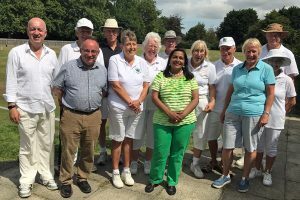 Fourteen top class players from all over the country, including Ripon, Watford, Cheltenham and Bakewell, contested the Maggie Cowman trophy over the two days of play. 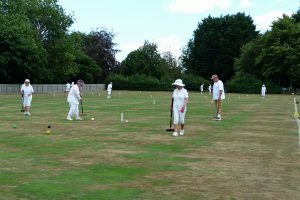 Five Chester players joined the competition, Trevor Farrell, Chris Thomas, Jayne Taylor, Garry Greenwood and Roger Edwards. The final match for the trophy was between two Chester players Garry Greenwood and Trevor Farrell. After an extremely close match the winner at 10-9 was defending champion Garry Greenwood who received the Maggie Cowman Trophy and a personal medal. 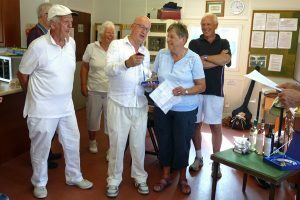 The Chester Bowl for second place was won by Ann Brookes from Colchester, and Steve Marsh from Bakewell won the Telford Plate. David Guyton presented the trophies to the winners and thanked everyone for making it such a successful event for the third year in a row. David Crawford was manager of the tournament.